HEINEKEN announced its Drop the C programme for renewable energy. With Drop the C the company aims to grow its share of renewable thermal energy and electricity in production from the current level of 14% to 70% by 2030. 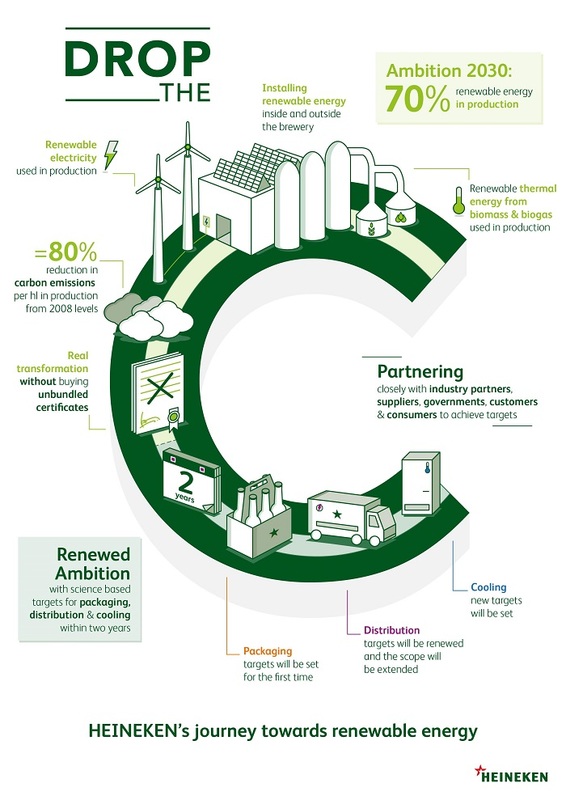 HEINEKEN wants to drive a real change towards renewable energy and will therefore not purchase unbundled certificates to meet its reduction targets. In addition, new emission goals will be set for distribution and cooling and, for the first time, also for packaging. The brewer commits to set science based targets for these areas in the next two years. Since 2008 carbon emissions at HEINEKEN breweries have decreased by 41% and in 2017 the company has already reached its 2020 emission targets in production. HEINEKEN commits to increase its share of renewable energy in production from 14% today (renewable thermal energy and electricity combined) to 70% by 2030. This implies an 80% reduction target in carbon emissions compared to the 2008 base year. During 2017 numerous projects have already been identified worldwide that will contribute to achieving the 2030 ambition. The targets will be externally verified by the Science Based Targets initiative. The company realises that its diverse and extensive geographical footprint poses a challenge as it includes many countries in Africa, Asia and Latin America where renewable energy solutions are not readily available.